This costume was so much fun to make and pretty easy too. All I did was, I bought a Styrofoam head from the local costume shop as well as the Frankenstein mask and green hands. I went to our local thrift shop and bought a small man's suit in black. Once the bottom is complete I used a lot of hot glue and glued on a full piece of Styrofoam to the bottom piece at the back to create an "L" shape. Now for the body, I took one of my husband's old gray turtle necks and tied off the bottom and arm holes with some string. I then stuffed the entire turtle neck arms and all with pillow stuffing (Walmart). Now take another dowel or paint stick around 12-14 inches long and insert it into the Styrofoam head at the bottom. This will allow the head to be a bit more stable. Now fit the head with the dowel into the neck of the turtle neck and pull the turtle neck up over the base of the head form. Take more hot glue and glue, generously, the turtle neck to the head form base. Once the head is secured you can put the mask over the head form. Make sure it covers up the any white parts (you can even spray paint the head form black if you want) I also added a scarf for added support. Now take the arms and hot glue on the green hands or you can use gloves whatever you want, just make sure you glue them on to the arm holes good. 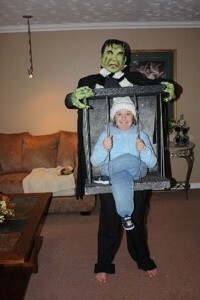 Once the hands are on take the suit jacket and put it on the turtle neck and pull the arms up and around the front of the cage to make it look like Frankenstein is carrying the cage. Do this with both arms (see picture). Have your child put on the pants (you will need a belt to hold them up) now try it on your child by putting it over the head so the child fits into the hole at the bottom. My daughter has on a hat to soften the weight on her head. It's not heavy just feels weird she said. Take the belt and wrap it around your child's waist/chest as tight as they can handle.This will hold up most of the costume weight. You can dress your child how ever you like, I put a jacket on Courtney and I took a pair of baby jeans and stuffed them creating legs to hang over the front of the cage and I put on a pair of baby shoes to simulate feet. This is all just glued on too.